Yiannis Mavraganis and a crew of Agile enthusiasts organized the first Agile Greece Summit on Friday 18 September 2015 in Athens. It was an honor to be there and give a talk on Nexus and Scaled Professional Scrum. I hope attendants got many ideas and inspiration from the sessions and from sharing problems and insights. I hope it helps the Greek economy in these difficult times. 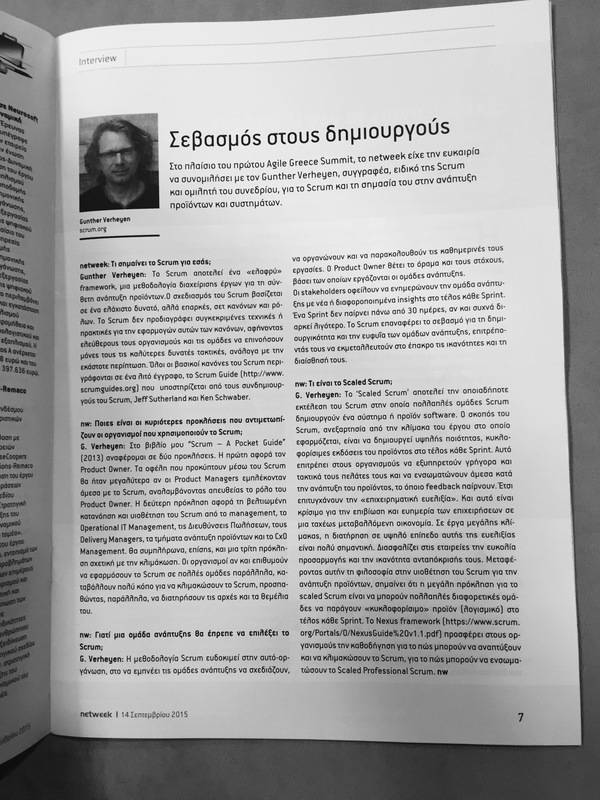 Preceding the event George Fetokakis published an interview with me in the Greek IT magazine netweek. Scrum is a lightweight framework for complex product development. Scrum has, by design, a minimal, yet sufficient, set of rules and roles. Scrum prescribes no techniques or practices to apply these rules to allow teams and organizations to devise the best possible tactics, depending on their context, to apply Scrum. All basic rules of Scrum are described in a lightweight document, the Scrum Guide, which is available at http://www.scrumguides.org. The Scrum Guide is maintained by the co-creators of Scrum, Jeff Sutherland and Ken Schwaber. Do you see any challenges in the organizations which use only Scrum? What do you think are some of the big threats to Scrum adoption or growth? In my 2013 book, “Scrum – A Pocket Guide”, I describe two future challenges of Scrum. The first challenge concerns the way the role of the Product Owner is fulfilled. We often see that representatives or proxies of product management are fulfilling the role. The benefits realized through Scrum would be higher if product managers would directly engage in Scrum, through the role of the Product Owner. The second challenge is the improved understanding and adoption of Scrum by management, think about operational IT management, sales divisions, delivery managers, product departments and hierarchical CxO management. I would add a third challenge, related to scaling. Many organizations have adopted Scrum and see the benefits at the scale of one or some teams. Organizations pursue the same benefits with many teams, but struggle in scaling Scrum while respecting the principles and foundations upon which Scrum are built. Why should a Development Team choose Scrum? Scrum thrives on self-organization, inviting and inspiring Development Teams to plan, organize and track their own daily work. Product Owner set out a vision and goals against which Development Teams work. Stakeholders are expected to provide the Development Team with new or changing insights by the end of every Sprint. A Sprint takes no more than 30 days, and is often shorter. Scrum fundamentally restores the respect for the creativity and intelligence of Development Teams, allows them to fully exploit their skills and insights. What is Scaled Scrum and how important is this method for big software development projects? ‘Scaled Scrum’ is any implementation of Scrum in which multiple Scrum Teams create one software system or product. The purpose of Scrum, independent of the scale at which it is used, is to create high-quality, releasable versions of product by the end of every Sprint. This allows organizations to quickly and regularly serve their customers, and to incorporate feedback into the development process fast. It is what we call ‘business agility’. It is crucial for companies to survive and prosper in today’s fast changing economy. At a larger scale, keeping a high level of such agility is highly important. It assures companies of flexibility and responsiveness. Translated to the adoption of Scrum for product development, it holds that the big challenge of scaled Scrum holds the ability for multiple teams to produce releasable software by the end of every Sprint. Our Nexus framework provides organizations with guidance on how to grow and scale Scrum, on how to implement Scaled Professional Scrum.